Global GSE has a wide variety of used aircraft tugs/ pushback tugs for sale. We also have smaller baggage tractors that can be used for moving small aircraft. With over 150 aircraft tugs/ pushback tugs and baggage tugs for sale, we are sure to have the right tug to meet your needs. If you do not see what you need here, please contact us as we have new stock arriving weekly. In aviation, pushback is an airport procedure during which an aircraft is pushed backwards away from an airport gate. Pushbacks are typically carried out by special, low-profile vehicles called aircraft pushback tractors or aircraft tugs. Generally, pushback tractors and airport tugs use a low-profile design to fit under the aircraft nose to reduce the possibility of accidental contact with the aircraft being pushed back. Some of the older models available were not low-profile tugs and special care was needed to be taken when pushing aircraft back using these type of airport tugs due to the increased height profile. For sufficient traction the pushback tractors are typically very heavy to provide good ground contact, with low gearing to provide the required torque to get a large aircraft moving. A typical tractor for large aircraft can weigh up to 60 tons. Braking systems on these tugs tend to be very powerful in order to safely stop the pushback tractor and aircraft. Depending on the type of pushback tractor the driver's cabin can be raised for increased visibility when reversing and lowered to fit under aircraft. Some aircraft pushback tractors have driver positions at both ends of the tug, to ensure good visibility when connecting the towbar to the aircraft and pushing back as well as when towing the aircraft longer distances. There are two primary types of pushback tractors: conventional and towbarless (TBL). Some modern remote-control aircraft pushback tugs are now appearing in the market place. These pushback tug units are typically electric powered utilizing onboard batteries which also provide ballast for the aircraft tug. Conventional tugs use an aircraft towbar to connect the tug to the nose landing gear of the aircraft. The towbar is connected laterally at the nose landing gear to a bar fitted on the aircraft nose landing gear but may move slightly vertically for height adjustment. On the end that attaches to the aircraft tug, the towbar may pivot freely laterally and vertically whilst connected to the aircraft tugs tow hitch. In this manner the towbar acts as a large lever to rotate the nose landing gear. Each aircraft type has a unique tow fitting so the towbar also acts as an adapter between the standard-sized tow pin on the aircraft tug and the type-specific fitting on the aircraft's landing gear. The towbar must be long enough to place the pushback tug far enough away to avoid hitting the aircraft and to provide sufficient leverage to facilitate turns. On heavier towbars for large aircraft the towbar rides on its own wheels when not connected to an aircraft. The wheels are attached to a hydraulic jacking mechanism which can lift the towbar to the correct height to mate to both the airplane and the aircraft tug, and once this is accomplished the same mechanism is used in reverse to raise the towbar wheels from the ground during the pushback process. The towbar can be connected at the front or the rear of the tractor, depending on whether the aircraft will be pushed or pulled. The towbar has a shear pin which prevents the aircraft nose landing gear from being damaged by the tug in case of high lateral loading or trying to turn the nose landing gear further than its design capabilities. When overstressed the shear pin will snap, disconnecting the bar from the nose gear to prevent damage to the aircraft and the tug. Prior to the aircraft being pushed back the hydraulic system which controls the aircraft nose wheel steering needs to be disconnected to allow the nose wheel to turn freely. This can be done using a bypass pin and isolating the relevant hydraulic system on the aircraft prior to pushback of the aircraft. Towbarless pushback tractors physically lift the aircraft nose wheel off the ground in order to move the aircraft. They hydraulically raise the nose landing gear, allowing the tug to maneuver the aircraft without connecting anything to the nose landing gear. This allows better control of the aircraft and higher speeds. The main advantage of a towbarless tug is its ability to connect to various aircraft types without the need to have multiple towbars available. The physical action and coordination required by the tug operator to move an aircraft with a TBL tug is less complicated and easier to learn than with a tug and towbar. By connecting the tug directly to the aircraft's landing gear tug operators have better control and responsiveness when maneuvering. This is most advantageous in general aviation settings where operators are often required to move more types of aircraft more often into more confined spaces than their airline counterparts. Manufacturers of electric TBL tugs offer models capable of moving any aircraft from the smallest single-engine type through narrow-body, military cargo aircraft and wide body aircraft. Just as specialized towbars are required for a wide range of aircraft, many TBL tugs use adapters which enable the movement of many unique aircraft. The majority of aircraft do not require adapters and can be moved without any special adjustments to the tug. This is in contrast to conventional tugs which often use so-called "universal" towbars which must have multiple towing heads to suit each aircraft type that is towed. Electric TBL tugs are gaining popularity among general aviation operators and FBOs as an alternative to gas or diesel-powered conventional tugs. Being electric rather than internal combustion-powered, electric tugs are low-emission which is a major advantage for environmentally-conscious operators; this also enables the tug to be safely operated inside a closed hangar. With modern battery technology improving the use of battery powered aircraft pushback tractors and tugs will likely increase. The Grove (Single Cab) MB-2 diesel aircraft tug is a tough, dependable unit with high versatility. This Class I MB-2 is rated with a 27,000 lbs DBP and a GVW of 40,000 lbs. The United SMLP-200D aircraft tug has a Detroit Diesel engine and has a 20,000 lbs DBP. Freshly painted and runs smooth. The mid 90's Grove MB-2 diesel aircraft tug has a split cab design and is Class I rated at 40,000 lbs GVW and having a 27,000 lbs DBP. The NMC-Wollard Model 60, A/S32A-30A tow tractor is used primarily to tow support equipment and has a 5,000 lbs DBP; therefore, its secondary mission is towing light aircraft and helicopters. This tractor has a 4-cylinder diesel engine, three-speed automatic transmission, hydraulically actuated front disc brakes, drum rear brakes, and front wheel, power-assisted steering. The NMC-Wollard Model 60, Military A/S32A-30A tow tractor is used primarily to tow support equipment and has a DBP of 5,000 lbs; therefore, its secondary mission is towing light aircraft and helicopters. This tractor has a 4-cylinder diesel engine, three-speed automatic transmission, hydraulically actuated front disc brakes, drum rear brakes, and front wheel, power-assisted steering. Used United SM340 Diesel comes equipped with a rear tow hitch and has a 4,000 lbs DBP. This tug is perfect for moving light aircraft and baggage carts. The Eagle MB-4 Bobtail aircraft tug/ pushback tractor has 4-wheel drive and 4-wheel steer. These tugs are in excellent condition, having done very low mileage whilst in military ownership. These Bobtail tugs are excellent for either pulling baggage carts or as an aircraft pushback tractor. 10,000 lbs DBP capable of towing up to 130,000 lbs. The Entwistle MB-4 model 9330 is a rugged medium sized diesel aircraft tug/ tow tractor with a DBP of 10,300 lbs. We have several of these units in stock, all from the late 1990's. These Entwistle MB-4's are in very good condition with low hours. The NMC- Wollard MB-4 diesel aircraft tug/ pushback tractor is a highly versatile tow vehicle offering 2 and 4 wheel drive with various steer modes. These units were totally rebuilt in 2015 and are in excellent condition with low miles since rebuild. With its 175,000 pounds towing capacity this tug will pull most narrowbody aircraft up to and including all Boeing 737 series and Airbus A320 series aircraft. Used Tug MC22-13 diesel aircraft tug is designed for narrowbody aircraft. The unit is fitted with four-wheel drive, disc brakes, power steering and automatic transmission which allows it to go forward or reverse with the same drawbar pull. Middle-of-tractor seating provides excellent visibility for operating in both directions. The MC22 is equipped with a Perkins 4-cylinder diesel engine. Used Tug MX4 is a zero-emission electric power baggage and light aircraft tug. Not only is the MX4 environmentally friendly, it's also user-friendly. The MX4 is designed with the operator and maintenance technician in mind. The MX4 features the Ecostar AC drive system, which offers the benefits of better electrical efficiency, allowing for longer operation between charges. The dash display of the MX4 seres as a diagnostic tool, allowing the technician to read faults and troubleshoot all from the driver's seat. The units we have in stock all have an enclosed cabin, a 4,500 lbs DBP, and new batteries. Used 1994 Harlan GHTDJ-40 gasoline aircraft tug/ baggage tractor with a 4,000 lbs drawbar pull. 214 hrs of service on meter. Fully enclosed cab with heat, and is freshly painted. 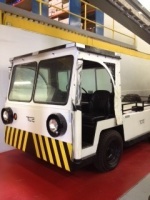 Used Tug MA50, perfect for maneuvering light aircraft, baggage carts, and other airport ground support equipment. The MA50 can tow up to 60,000 lbs with its 5,000 lbs DBP. The MA series is long known for its reliability and rugged design. Used NMC-Wollard Model 140-12, Military A/S32A-42-12 aircraft tug/ pushback tractor is ideal for pushing back regional jets as well as corporate jets and GA aircraft with its 12,000 lbs DBP. It has a 6-cylinder gasoline engine, 3-speed automatic transmission, hydraulically actuated front-disc brakes, drum rear brakes, and front wheel power-assisted steering. Used NMC-Wollard Model 140-12-16, Military A/S32A-42-12-16 aircraft tug/ pushback tractor is ideal for pushing back regional jets as well as corporate jets and GA aircraft. This vehicle is fitted with weighted plates allowing it 16,000 lbs DBP. It has a 6-cylinder gasoline engine, 3-speed automatic transmission, hydraulically actuated front-disc brakes, drum rear brakes, and front wheel power-assisted steering. The Tiger TIG-50 Propane aircraft tug/ baggage tractor is ready to meet your needs with its 5,000 lbs DBP. The Jetline M-50 propane-powered aircraft tug/ baggage tractor has a 5,000 lb DBP. 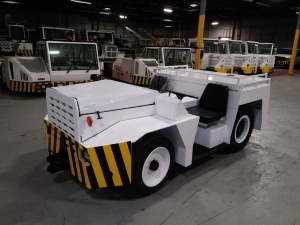 The EquiTech M-50 propane aircraft tug/ baggage tractor has fresh paint and is capable of 5,000 lb DBP. It also has a partially enclosed cab to help keep the operator shaded and somewhat protected from inclement weather. Used Tug MH-50, light aircraft tug/ baggage/ warehouse tractor, up to 25 mph, enclosed cab, 4,000 lbs DBP, 3000 lb rear deck capacity.